Race for the Galaxy AI is an implementation of the boardgame Race for the Galaxy. The game includes all three expansions from arc #1, plus the cards from arc #2. The "Orb Game" is not supported. The is a local vs-AI mode and online multiplayer. 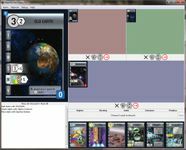 It features the original card graphics and a challenging AI. This not an official implementation, but it is fully authorized. An alternate "web app" version is under development by another developer. The program is a free download from the developer's site. Version 0.7.0 - The base game and all three expansions are supported. Online multiplayer is supported. Source: The Developer Website.